It's over a year now since I reviewed some of the class-T amplifiers like the Autocostruire 2020, and the DiyParadise Charlize. Both amplifiers have gone on to become very popular but mainly with those who have 'easy' speaker loads to drive. Love them or hate them, these 'digital' amplifiers are here to stay and the next generation has arrived, mainly offering more power. One such amplifier is the Autocostruire Class-T MC4x100 based on the TAA4100A chip from Tripath. The MC4x100 takes advantage of the four channel capabilities of the TAA4100A. Power output is quoted as "up to 100W per channel" with "up to" being the important bit! Much depends on the power supply, and while you can operate the MC4x100 on a 12 volt supply (like the 2020 amplifiers), to take full advantage of its capabilities, a supply of 24-27 volts is recommended. That 100W figure is also quoted at 20% THD+N. The figure at 0.1% THD+N is 60 watts. Without being too technical this means that if you push the CT4x100 to give give you 100 watts, it won't sound as good as it does putting out 60 watts because you are substantially increasing distortion! Like the other class-T amplifiers sold by Autocostruire, the MC4x100 sports air-core inductors, build quality is excellent, and it comes ready to install with all the necessary on-board connectors. Despite the extra two channels, it is still a relatively compact design with the PCB measuring only 12 cm by 7.5 cm. There is over-current and over-voltage protection built in, and a pop-free start and stop control, which works fine if you don't change the input capacitors for anything of higher value. The amplifier comes as a ready-built (and tested) module, complete with an on-board power supply, requiring only the addition of a suitable transformer. This makes it a suitable project for just about anybody who can use a soldering iron. All that is required is to install the unit in a suitable housing, add the input, output and power connectors, a mains switch and fuse, and it is ready to use. These more powerful class-T amplifiers do require a heatsink, and the one supplied makes the module physically larger than the lower powered amplifiers that I reviewed last year. Consequently, I couldn't fit the MC4x100 in one of my pods and I had to look around for something that would 'do' for this review, but still present the amplifier as a serious piece of hi-fi. In my junk box, I found an 'expired' computer PSU that was just the right size for the amplifier module. And from an old project, I had an aluminium box that the 160 VA 18-0-18 toroidal transformer (also supplied by Autocostruire) would fit it. The MC4x100 module comes with on-board connectors for all the necessary connections making it fairly easy to wire everything up. My only complaint would be with the signal input connector that places all the wires very close together. It's not too difficult to solder to but you have to get the four ground wires onto one tiny pin. Apart from that, everything is quite easy and there is even a connector for an external DC power supply, should you wish to use something like a battery supply or SMPS. As ever,the most time and work goes into preparing the case, cutting holes for switches, fuse-holders and sockets etc. But it shouldn't take much more than a few hours to get the MC4x100 up and running. Having completed the installation, I measured the DC offset on each channel and found it to be negligible. The beauty of the MC4x100 is that you don't have to use it as a four channel amplifier. You could of course use only two channels for a stereo set up. If you do this, it is recommended to use load resistors on the two unused channels although I know some users do not, and have not reported anything unpleasant happening. 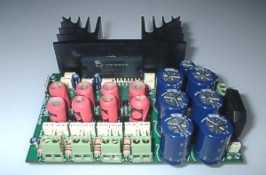 It is better to parallel the outputs which will increase the available power output. The other options include using the MC4x100 to power active loudspeakers or for bi-amping. So you can see that this is a very versatile amplifier! First off, I paralleled the outputs and connected the MC4x100 up in my 'second' system using my IPL A2 speakers. It was obvious from the outset, that this amplifier had tremendous control and grip of the speakers. Nothing I had used previously with these speakers had such a 'grip' on the lower frequencies! I was comparing the sound to that of the Charlize amplifier and to be honest, I preferred the less powerful amplifier as regards overall sound quality. But there wasn't much in it and the MC4x100, to be fair, had very little time on it. The sound quality was very good though. Clarity and timing were very good and there was no emphasis on any one part of the frequency range over another. Moving the MC4x100 downstairs to my main system, I connected it up to the Hawthorne Audio Silver Iris coaxial drivers in open baffles. Again the outputs were paralleled (I was using only the coaxial drivers in the baffles) and again I was impressed by the control over the drivers. This pair worked well together and I left the amplifier in system until I had built version two of the Hawthorne open baffles using the added bass augmenter drivers. Then it was time to use all four channels of the amplifier separately. 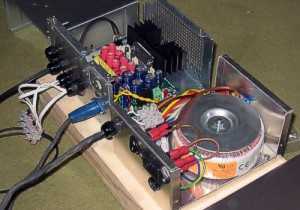 Two would power the coaxial drivers while the remaining two would power the bass woofers via an active crossover. Once again, the combination of amplifier and speakers sounded 'right'. However, listening very carefully, I felt the control of the woofers was not quite as good as when using the MC4x100 in paralleled mode. The next 'task' for the MC4x100 was to drive some Monitor Audio GR60 speakers at a friend's house. Here the MC4x100 replaced four Gainclone monoblocks. The results were a little as I had expected. The bottom end was much improved, sounding both deeper and better controlled. But the mid and upper ranges lacked that magic that they have with the GCs. My friend wanted to buy the MC4X100 for the bass and keep the GCs for the upper ranges until I explained that the phase issues with the class-T amp would make it difficult to match it seamlessly with the GCs. But it did make me wonder if the upper ranges of the MC4x100 could be improved. Back home, I replaced a pair of the 0.47 uF polyester input caps on the MC4x100 with 0.68 polypropylene types. This made a distinct improvement when listening though the open baffles (with the upper ranges amplified through the modified inputs). It would seem that all these class-T amplifiers benefit from better input capacitors and you may wonder why suppliers don't fit them as standard. Well the first hurdle is the cost, and in the competitive world of commercial audio, every penny counts. Then there is the size issue. Polyester capacitors can be quite tiny but move to anything like polypropylene, or better, and the size of the capacitors can require a large amount of PCB space, making the whole amplifier module much larger. Finally, choice of capacitor is very much a matter of personal taste, so it is probably best left to the customer to choose. Moving the MC4x100 back to my second system, I listened for a while and then compared it to the Autocostruire 2020 amp. With the polypropylene input caps (and more use), there was now much less difference between them. Time for the next experiment. I had built the MC4x100 so that I could connect the toroidal transformer via a lead and plug. I unplugged the transformer and connected up a couple of 12 volt batteries wired in series to produce a 24 volt supply. This resulted in a slightly more relaxed performance, quite refined, and ideal for acoustic music, jazz and solo vocals etc. As somebody pointed out to me, there are batteries and batteries. A 'good' battery supply will have a newish battery and enough current reserve not so sound 'soft' as the smaller SLA batteries do, more so when they are getting old. With my smallish battery PSU I'm not sure if I preferred batteries overall to the transformer linear supply, it was more a case of some types of music sounding better on one or the other. Next up was a pair of Skynet 8080 SMPS modules, again wired in series to produce a 24 volt supply. I had preferred the smaller class-T amplifiers with an SMPS, something that many other class-T owners have discovered as well. But for some reason, the improvement the SMPS made with the MC4x100 was even greater. Bass was deeper and tighter and the top end slightly 'cleaner'. It was quite astounding how good this combination was. I'm beginning to wonder if there is something about the 'digital' amplifiers that makes an SMPS particularly suitable. My ears tell me there is! As I seem to be constantly recommending the SMPS, and I also sell some through my web site, I would like to make it quite clear that the two are not connected. The Skynet modules sold through Decibel Dungeon are supplied by another party, not me. If we were looking to take advantage of my position as a TNT reviewer, we would sell the SMPS modules for at least the 70 GBP that they actually cost to have made, rather than the token price asked to encourage people to try them! Given more time, I would like to have made up some active crossovers and tried the MC4x100 with my two way speakers but there are only so many hours in a day. But I hope this review has illustrated what a useful piece of equipment this amplifier is. Over all, sound quality is very good, and there should be no shortage of power for driving most speakers. For me, it came close to the sound of the better small class-T amplifiers although I still (just) prefer the sound of a Gainclone (in the middle and upper frequencies). That said, unless it is paralleled, or bridged, a GC is not going to have the sort of driving capabilities that the MC4x100 has. Yes, another review, another hi-fi compromise! One other test I would like to have done would have been to try the MC4x100 driving some electrostatic loudspeakers ! I am told that (when paralleled) it should be able to drive the low impedance loads that the ESLs present. Unfortunately, with no access to some ESLs, I was unable to put this to the test. However, I did do a bit of checking on the usual forums and found somebody successfully using a MC4x100 with his ESLs, although he was keeping his voltage supply down to 15 volts. It's also worth noting that powering four channels with something like the MC4x100 is a lot easier as regards space. Changing to Gainclone amplification with something like the Hawthorne Audio Duets means two amplifier cases, each about the size of the MC4x100 (including its power supply), and another two larger cases with the GC PSU's, three shelves of the hi-fi rack, compared to only one for the MC4x100)! Like I said, the MC4x100 is a very useful piece of gear if you require multi-amping. If four channels aren't enough for you, Autocostruire also sell an eight channel version, the MC8x100. Home Theatre is now well within reach of the DIYer! And remember, the class-T amplifiers are much more efficient than the analogue type, more so when you are using four or more channels! Summing up, the CT4x100 is a very competent amplifier, although not my ideal sound, it will appeal to those who like the class-T 'sound'. Think of the CT4x100 more as a Rangerover or Toyota Landcruiser, rather than a Ferrari or Rolls Royce; its usefulness being its chief attribute. Having said that, the sound I got with the SMPS with my IPL A2s was nothing short of awesome! Given the price for four channels of amplification of this quality, it is also something of a bargain! The Tripath TAA4100A has enabled higher power from class-T but not necessarily better sound quality than was squeezed out of the Tripath 2020 chip (to name but one). It's also worth recording that I found this amplifier sounded much better with my IPL A2 speakers than the Hawthorne open baffles!